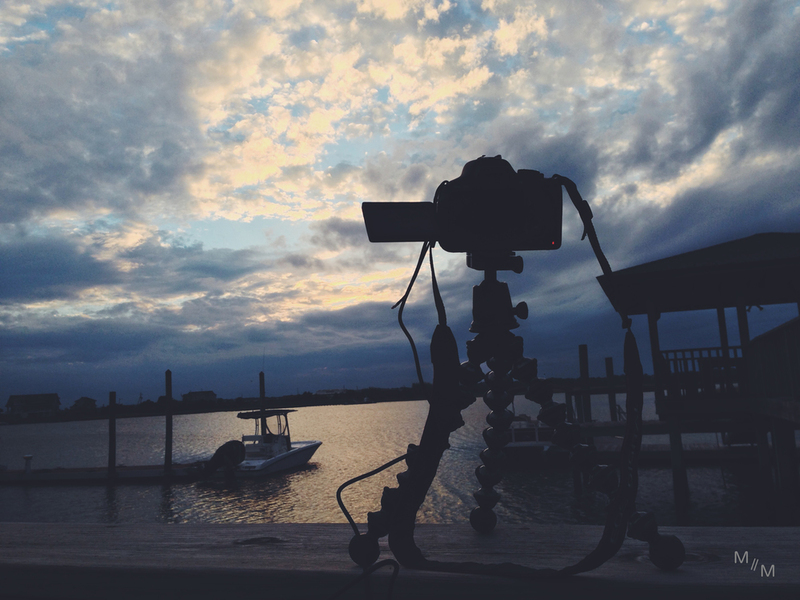 For as long as I've been taking pictures of the sunrise, I've always wanted to shoot time-lapses. A good friend approached me about doing a music video for he and his brother's new band, ScreamCreature. The band- comprised of my bud Rob, his brother Chris Culos (O.A.R.) and Danny Chaimson (Gold Coast All-Stars), was set to release their first single, "Bonfire," and wanted a video to go along with it on their website and social media accounts. I was game, but there was the important fact that Rob was in San Francisco, Chris was on tour, Danny was in Chicago, and I was here in NC. No problem- music videos don't always have to feature the band. Rob and I emailed back and forth on some ideas on how to make this work from across the country. At the heart of "Bonfire" was a love-song, but he wanted to make the video about something other than the typical guy and a girl love-story. Since we were limited with money, equipment and short on time, I had to figure-out something that I could shoot and edit together on my own. When thinking outside the love-story theme, Rob suggested the idea of using nature/beauty shots or ephemeral imagery. This was perfect. For a while I wanted to create time-lapses from the sunrises I see every morning, capturing the beauty about them. * Each day is different from the next- the way the clouds move with the rising sun, changing colors across the sky, and how fast it all occurs are all what makes it worth setting an early alarm for, and finding the ideal evening sunset location. Shot over the course of a week, I biked around to some of my favorite spots on Wrightsville Beach, set-up my camera and enjoyed the scenery. I was lucky to work with a variety of partly-cloudy days and plenty of sunlight. When I wasn't outside chasing the sun and shooting time-lapses, I was home off-loading cards and exporting files. By the end of the week I had taken over 13,000 pictures from twenty different locations around the island. After a few rough-cuts of the video, the band agreed that it looked good but still needed more of an identity- something that made it feel like a ScreamCreature video. The early edits helped to establish a visual-tone that went well with the music, but what we realized it lacked was a human element after-all. The visuals were strong enough to carry the ephemeral theme we established early on, but I still wanted to avoid the love-story idea. Rather than introduce a couple in love, I wanted to use a lone-female character and keep the idea of her presence ambiguous so that it raised more questions than it answered. I enlisted the help of my girlfriend and filmed her early one morning in the beach access as the sun was rising. Keeping with the theme of her character being ambiguous, I had a solid direction in mind. I filmed Sarah walking through the Access, never focussing on her facial features but instead kept her silhouetted as the sun rose above the dunes. Throughout the video, her character drifts further away from the camera alluding to the fact she was growing distant from us. Rather than explicitly show scenes of a guy and girl falling in/out of love, I wanted these new shots combined with the time-lapse footage to create a sense of love lost, keeping with the lyrical theme of "Bonfire." Not only did this project give me the chance to film and edit time-lapses and mess around with different frame-rates and speeds, but it also challenged me visually as a filmmaker. The final video had a lot of stylized edits that helped bring something more to my work that wasn't there before, and it was through working back-forth with Rob and the band's notes that we found the love-story and it finally became a ScreamCreature music video. UPDATE: Bonfire was selected to play the 20th Annual Cucalorus Film Festival, click here for more!